I was going through some pictures on my computer today and I came across this one. This picture was taken October 23, 2012. 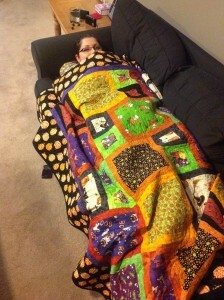 I had just given my son and daughter-in-law a quilt for Halloween that year and my son took this picture and sent it back to me. My previous post today was about the length of a quilt that I am making as a gift for someone. My kids like quilts that are long enough to completely wrap around themselves like my daughter-in-law is doing in this picture. I started working on a series of Halloween quilts. I have a stash of Halloween fabrics left from previous projects, so I pulled them out and started working with them. My Scrappy Log Cabin project is finished to the inner border stage. 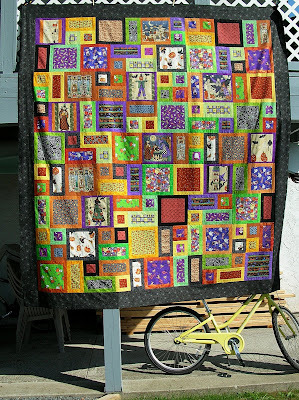 I have an idea for the outer border that was inspired by Gwen Marston and Freddy Moran in their Collaborative Quilting book. Because the blocks for this quilt are a bit wonky, I thought I would refer to the Queens of wonky piecing, Gwen and Freddy to find a suitable border treatment. I may consider putting some Linda inspired blocks in the corners of the Gwen and Freddy inspired outer border. 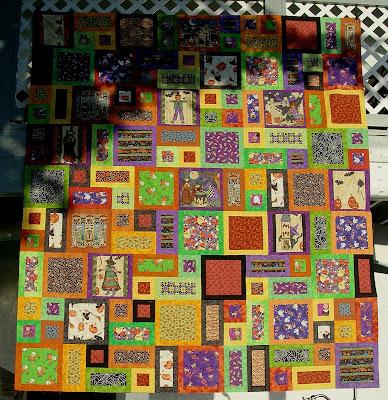 While I was putting the narrow green border on the Scrappy Log Cabin, I remembered that I had some leftover blocks from the queen size All About Me Halloween quilt that I made two years ago. I thought I might be able to incorporate these blocks into the back of the Scrappy Log Cabin. I started putting the blocks up on the design wall and I realized that I had more blocks than I remembered. In fact, I had enough blocks to make another lap quilt. So before I finished the borders on the Scrappy Log Cabin, I switched gears and assembled the lap size All About Me Halloween quilt. 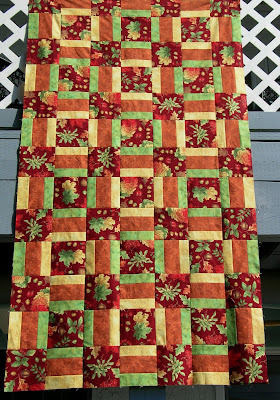 I love the pumpkin border fabric on this quilt. It is a Debbie Taylor-Kerman fabric from her Spooktacular line by Henry Glass Co. If you double click on the photo you might be able to see the mice peeking out from under the pumpkins. While I was working on both the Scrappy Log Cabin project and the All About Me project, I started to think about the new pattern I bought on my recent vacation to Alberta by Joanie Morrow–Contemporized Country Squares. I still had some Halloween fabrics left in my stash so I made 6 test blocks. The blocks are large–11.5 inches, but perfect to showcase a novelty print. I love the test blocks so I will definitely be making some more blocks from this pattern. Our little on-line group of quilting friends has started calling this easily distracted type of quilting, “serial quilting.” I have heard some quilters refer to themselves as having some sort of attention deficit disorder which leads them to start multiple projects at once. I prefer to call this, serial quilting as I think it has a more positive tone. This is the way my quilting mind works–always thinking of the next project. After all, I started out to make one Halloween quilt and now I have three Halloween quilts on the go. In the end it really doesn’t matter what you call it as long as you have fun….right? And I am having fun! This is my Halloween All About Me quilt–finally finished to the flimsy stage. In this picture, the quilt is hung from our deck. I have left my bike in the picture so you get the perspective of size–this is a large quilt! 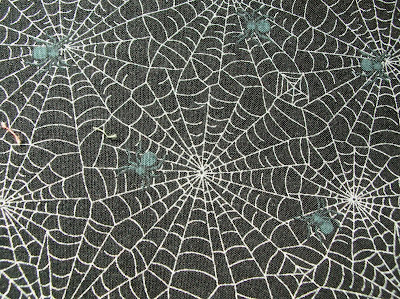 This is a closeup of the spiderweb fabric that forms the border of my Halloween quilt. I think this border print made the quilt. This is my first attempt at the Wonder Wallet. This prototype has been claimed by my DD. 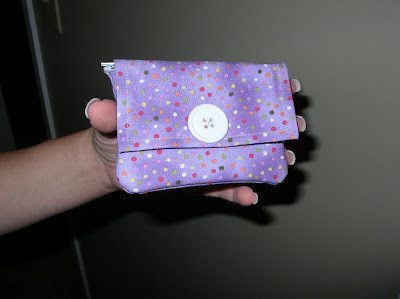 I modified the pattern to include a zipper–you can see the zipper pull poking out of the left side of the wallet in the picture. My daughter is using this for her i-Pod. She thinks that i need to make a couple of modifications to this prototype for earphones, charger, etc. Hmmm….she has me thinking. This is my latest project. This pattern is Warm Wishes from the Quiltmaker magazine. I love this pattern and have made it several times. I had the fabric to make this quilt for years and decided that it had aged long enough and it was time to make this quilt. This is approximately 1/3 of the center of the quilt. Of course I will add borders. The final size of this quilt will be determined by the amount of fabric I have. This is the progress on the All About Me Halloween quilt so far. The only place I could find to take a picture of this quilt was off my deck. Since it is evening, the sun is quite low in the sky and is responsible for casting a shadow from the tree over the top left hand corner of the quilt. This piece now measures 88″ x 99″. The pattern does not call for a border, but I think I will end up adding a border anyway. This is tonight’s progress on my Halloween version of “All About Me”. Three rows are now together. I am having a little bit of difficulty since I don’t have a design wall to put this up on. I tried placing the blocks on a piece of flannel. That worked, but I don’t have a wall big enough to hang the flannel on. I have been using the floor as a substitute design wall and then moving the blocks to the bed of my long arm. I am planning to make my quilt 8 blocks wide by 9 blocks long. That will make my quilt’s finished size 88″ x 99″. I haven’t decided if I will add borders or not.